Reduce MOV file size by changing video resolution, bit rate, format, frame rate, etc. Support 1000+ video/audio formats including MOV, MP4, AVI, WMV, MKV for compression. Compress MOV files in batch on Windows/Mac without losing any quality. Crop, trim, and cut unwanted video parts with real-time preview. MOV format is a highly compatible video format developed by Apple, but it always large-sized and takes much space on your Mac. If you want to email a clip or simply need more storage space, then you may need to reduce MOV file size to make the most efficient use of your storage space. To help you achieve that, the best 2 methods about how to reduce MOV file size on Windows/Mac and online are introduced below. Wondershare UniConverter (originally Wondershare Video Converter Ultimate) is what we recommend most to reduce MOV file size on Windows/Mac. It enables MOV compression by modifying video and audio settings according to your needs, you can change your video resolution, bit rate, format, and more others with a 20 seconds preview. Edit MOV videos can also be done here to downsize MOV, you can cut your unwanted parts by trimming or cropping and make other features as you need. Here is a detailed guide about how to reduce the size of MOV on Windows/Mac. Reduce MOV file size by changing video resolution, bit rate, frame rate, encoder, formats, etc. Support 1000+ video formats including MP4, MOV, AVI, MKV, WMV, etc. Crop, trim, cut MOV unwanted parts and add watermarks, apply effects, edit subtitle as your needs. Transfer videos from PC/Mac to mobile devices easily via a USB cable. Burn MOV files to playable DVD/Blu-ray disc with free menu templates. Download or record videos from 10,000+ video sharing sites like YouTube. 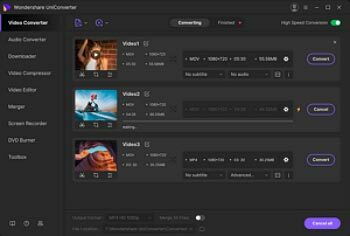 Versatile toolbox combines fix video metadata, GIF maker, cast video to TV, CD burner, and screen recorder. Supported OS: Mac OS 10.14 (Mojave), 10.13, 10.12, 10.11, 10.10, 10.9, 10.8, 10.7, 10.6, Windows 10/8/7/XP/Vista. Before you start to reduce MOV file size on your Mac, you should download and install it firstly, it's safe and free to download and install. Windows users can also download the Win version and follow the similar steps below to reduce MOV file size without losing quality. Click the +Add Files button to load your destination MOV file from your Mac. Or you can directly drag and drop your desired MOV videos to the program. Multiple MOV files can be added here. Then click the drop-down icon beside the Convert all tasks to: option and select Video > MOV, also a video resolution. You can change the output format if you want to play your MOV videos on other devices such as iPhone/iPad, then go to the Device tab to find the desired format. Click the left editing icon under the just imported MOV video to get a separate Trim window, then refer to Trim Video to learn how to cut the unnecessary part of the video file. You can get the Crop window by clicking on the second crop icon. Then click the compress icon on the Target bar, a new window will open. You're allowed to reset the MOV file parameters like resolution, bit rate, and file size, tap on the Preview button to check what it will be and click the OK button to save the changes. Click the Convert All button to start reducing the MOV file size on your Mac. Once it finished, switch to the Converted tab to get the reduced MOV videos. If you just want to reduce one MOV file in a much easier way, then you should learn How to Compress MOV Easily >> for detailed steps. 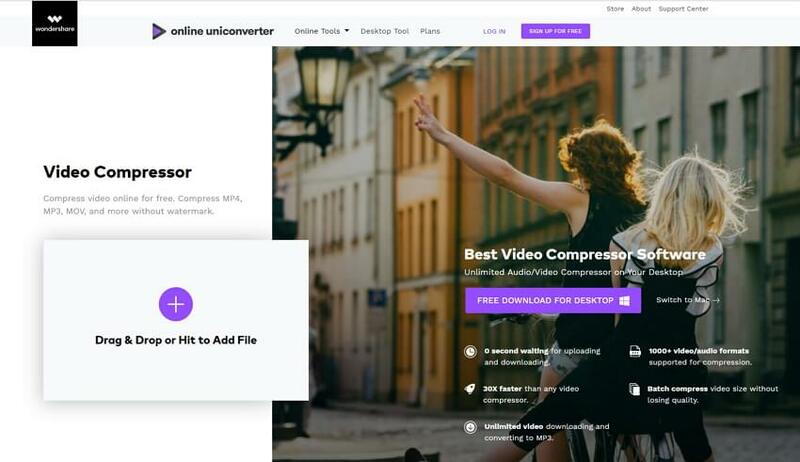 Online UniConverter (originally Media.io) is the best online MOV compressor free to use. You can reduce the MOV file size free online without any software download and installation, the totally free online tool can compress videos without any ads and watermarks. It helps you to change video resolution, output size, and video format to downsize MOV file easily, you can download the compressed MOV file directly or save it to Dropbox. However, you can only compress one file at a time. Follow the simple steps below to learn how to reduce MOV file size online. 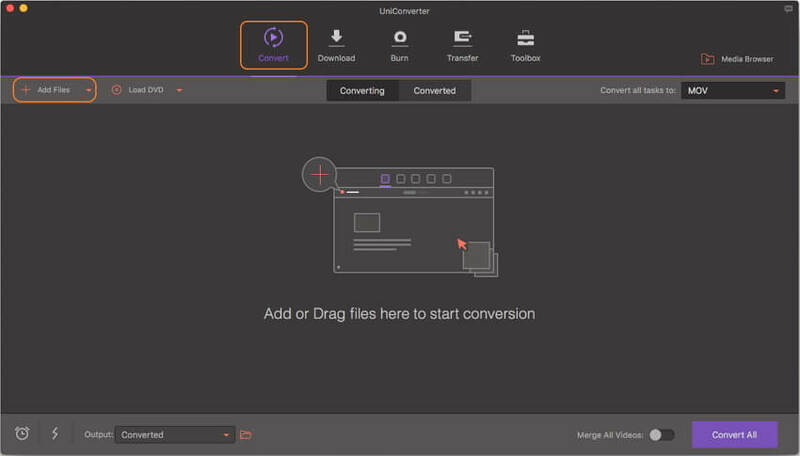 Step 1: Open Online UniConverter (originally Media.io) (https://www.media.io/video-compressor.html) from your browser, and you can see the Drag & Drop or Hit to Add File button, click it to select your MOV video. Step 2: Once the MOV file added successfully, you can change the video resolution, output size, and format as your needs. Step 3: Finally, click on the COMPRESS icon to start reducing MOV file size online and free. The process takes a few minutes according to your video length and network speed. For a better experience on reducing MOV size, we recommend Wondershare UniConverter for you as it can compress MOV faster and in batch, edit videos with real-time preview, and has more additional functions. Free download and have a try! QuickTime Converting .MOV to MOV? Is it Crazy!